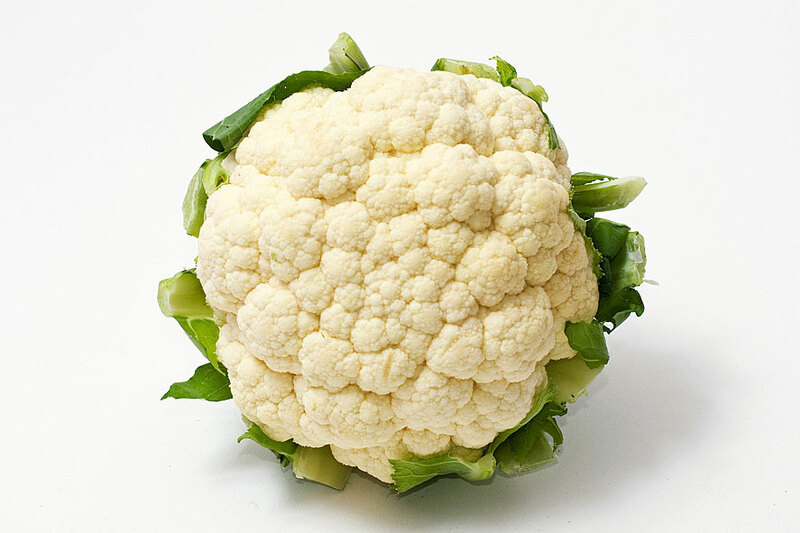 Many people find cauliflower bland and uninspiring, and when this colorless vegetable is unseasoned and eaten by itself, I’d have to agree. But you should never underestimate the power of the cauliflower. It’s remarkably versatile with a mild flavor that can work to your advantage, and although it is not a starchy vegetable, its unique texture makes it a perfect substitute for other starchy foods. Typically, cauliflower is eaten raw, steamed or boiled. Try it roasted, however, and it will knock your socks off. Since cauliflower is not high in carbohydrates like bread or potatoes, it’s a great option for those with diabetes who need to limit their carbohydrate intake. Don’t be fooled by those that say, “Don’t eat anything white.” Cauliflower is high in fiber, folate and vitamin C, and if you buy the pretty purple cauliflower you will also get disease-fighting antioxidants. Preheat oven to 450 degrees. Line a pizza pan with parchment paper. Toss florets into a food processor and pulse until it resembles a crumb consistency. Place cauliflower crumbs into a microwave safe bowl and microwave for 4 minutes, covered. Allow cauliflower to cool enough to touch. Spread cauliflower out onto paper towels; wrap it up in a clean dish towel. Ring it to get as much water out as possible. In a large mixing bowl, combine the dry cauliflower with remaining ingredients. Move “dough” onto the parchment paper and make a tightly formed ½-inch-thick crust. Bake for 10 minutes, or until the top begins to brown. Remove from oven, spread with marinara sauce, toppings and cheese. Bake for another 6 minutes until cheese has melted.